Scandi-style is all about a minimalist, clean look. Set some time aside to work through all your belongings and sell anything on a site such as Gumtree that is not deemed useful or loved. Not only will you feel more organised – but your bank account will benefit too! The Scandinavian look is synonymous with looking fresh and light. For a super quick update, think about painting all your walls white or a soft pale grey. 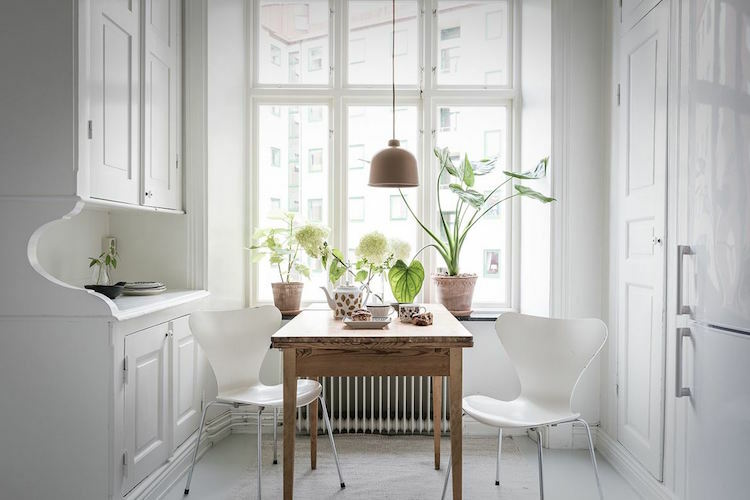 In a region, which is deprived of light for six months of the year, creating a light and airy living space is something of an obsession for Scandinavians. Use mirrors in different shapes and sizes to reflect the light into the darkest of corners. For a truly Scandinavian look, the wall-to-wall carpets need to go. Consider pulling them up (you never know, there might be a wood floor underneath waiting to take centre-stage!) or simply get Quick-Step Balance Click and add a mix of rugs – they can even be layered for greater coverage. At sunset, Scandinavian homes are transformed into a cosy womb-like oasis. Add dimmer switches and plenty of candles to create a warm atmosphere. It may not sound ‘budget-friendly’ but any Scandinavian will tell you that if you invest in classic, beautifully crafted pieces made from high-quality materials, they’ll stand the test of time – they don’t need to be expensive, it’s amazing what you can find secondhand! Scandinavians are masters at combining form with function. Look for multitasking furniture such as sofa-beds, a coffee table with built-in storage etc. It’ll mean you’ll need to invest in fewer pieces and have a more practical home to boot! Give old, tired looking pieces a new lease of life with a lick of paint, a good wax or new fabric. It’s amazing what you can find for a fraction of the price online – and with a little creativity, it could become a masterpiece. After all, one man’s trash is another man’s treasure! Add a warm and inviting feel to the minimalist home using soft, natural textiles such as linen, wool and sheepskin to ensure your home is autumn-ready! You are never far from nature in Scandinavia, which is why it plays such an important part in the home. Studies have shown that houseplants are great stress-busters and help to clean the air! For seasonal updates, go for a forage in the woods, along with the beach, in your local park – or even in the cracks between the pavement – and create vignettes with wildflowers, pinecones, and pebbles.